With DeMar DeRozan traded to the San Antonio Spurs a new era begins for one of the finest organizations in all of basketball. The DeRozan’s acquisition signals that the Spurs are not looking to rebuild after entering a season without either Tim Duncan or Tony Parker in their roster for the first time since 1996. For a franchise that for more than a decade has been considered the NBA’s gold standard, the 2018-19 season begins with an uncertain future after shipping away Kawhi Leonard to the Toronto Raptors as part of the same trade that brought DeRozan to San Antonio. Keeping Leonard was obviously impossible as he had expressed that he wanted to leave the Spurs after an injury-plagued season and was looking forward to playing with the Los Angeles Lakers. Although the Spurs refused to send Leonard to the Lakers to avoid helping a conference rival that had already added LeBron James, they did grant his wish by sending him to the Raptors. Now with DeRozan as part of their team, it will be up to head coach Gregg Popovich to find a way to better utilize his talents and at least help them reach the NBA playoffs for the 22nd season in a row. It won’t be easy to replace Leonard, but DeRozan should help keep the Spurs in the playoff race as he will be the go-to guy along with LaMarcus Aldridge. DeRozan gives the Spurs a perimeter threat that is a great isolation scorer and an improving three-point shooter that will help take a lot of pressure off Aldridge as last season he was forced to shoulder almost all of their scoring while Leonard was out for almost the entire year. 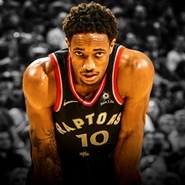 Leonard and DeRozan should play well together as DeRozan has improved his passing and playmaking ability over the last few seasons and he’s become a willing and capable passer that possesses a great court vision. Thus, DeRozan should be able to find the open player whenever he’s double teamed. Even though he will be tasked with handling a lot of assists, he will still get a lot of shooting opportunities and could turn into one of the team’s top scorers as he will be expected to help fill the void left by Leonard on offense. DeRozan has also improved defensively over the years although he’s not as talented as Leonard. He can be considered a serviceable defender that won’t hurt the team as he’s far from being a weak link on that side of the floor. He will benefit from playing in the backcourt with Dejounte Murray who is among the NBA’s elite defenders at the guard position and will most likely take the hardest perimeter defensive assignments. The Spurs defensive stats could take a slight dip, but they should still be a solid defensive team and reach the playoffs once again.